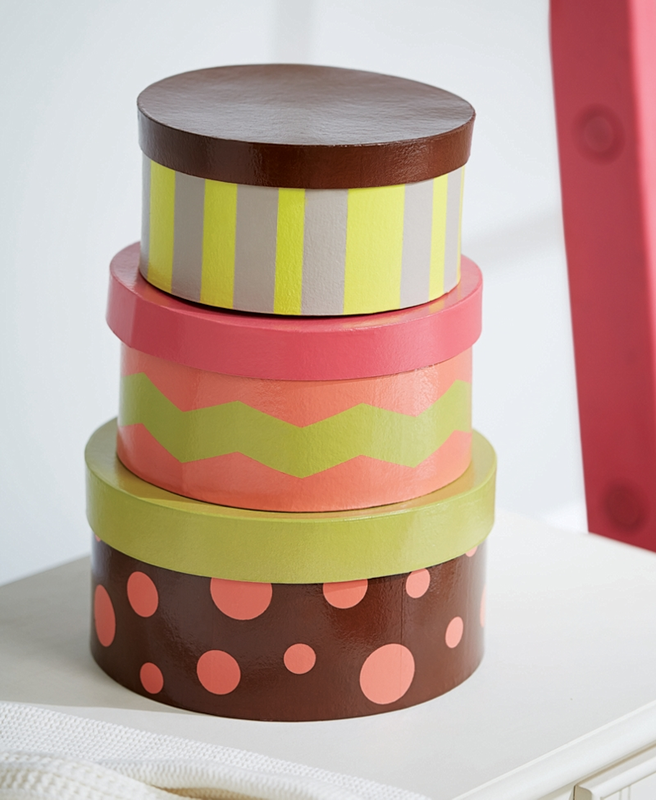 Turn plain paper mache boxes into fun and stylish storage. Adorable Storage was designed by Vicki O’Dell. Inspire your next home décor project by exploring more Home Décor spray paint projects from Krylon®. When working with unfinished wood, prepare your surface by sanding smooth and wiping clean with tack cloth. Apply a Krylon® ColorMaster™ Primer to seal the surface. When working with bare metal, be sure the surface is free of rust and oil before applying Krylon® ColorMaster™ Primer to seal the surface. If using plastic, glass or ceramic, lightly sand surface with fine sandpaper and wipe clean with a tack cloth. This will help the paint to adhere better to these smooth surfaces. Apply a primer to further improve adhesion. Remove the sticker from the bottom of the box. Paint the exterior of the box bottom and lid with Krylon® ColorMaster™ Primer in White. Paint the bottom of the box with Krylon® ColorMaster™Coral Isle. Let set overnight. Paint the lid of the box with Krylon® ColorMaster™Ivy Leaf. Let dry. Apply vinyl circles to the base of the box. It helps to apply them to a shop cloth, your pants or other slightly fuzzy fabric to remove some of the adhesive. Paint the base of the box with Krylon® ColorMaster™Leather Brown. Let set for several hours or overnight and then remove the circles from the box. Paint the bottom of the box with Krylon® ColorMaster™Ivy Leaf. Let set overnight. Paint the lid of the box with Krylon® ColorMaster™Watermelon. Let dry. Apply Frog Tape shape tape to the base of the box. Paint the base of the box with Krylon® ColorMaster™Coral Isle. Let set for several hours or overnight and then remove the shape tape from the box. Paint the bottom of the box with Krylon® ColorMaster™Pebble. Let set overnight. Paint the lid of the box with Krylon® ColorMaster™Leather Brown. Let dry. Apply painter's tape to the box to create stripes in varying widths. Paint the box with Krylon® ColorMaster™Citrus Green. Designer Tip: Removal of product and price stickers is easier if the sticker is heated a few seconds with a heat gun or blow dryer.